Chicago is three games into their second round match up and they are sitting in unfamiliar territory, trailing the series 2 games to 1. 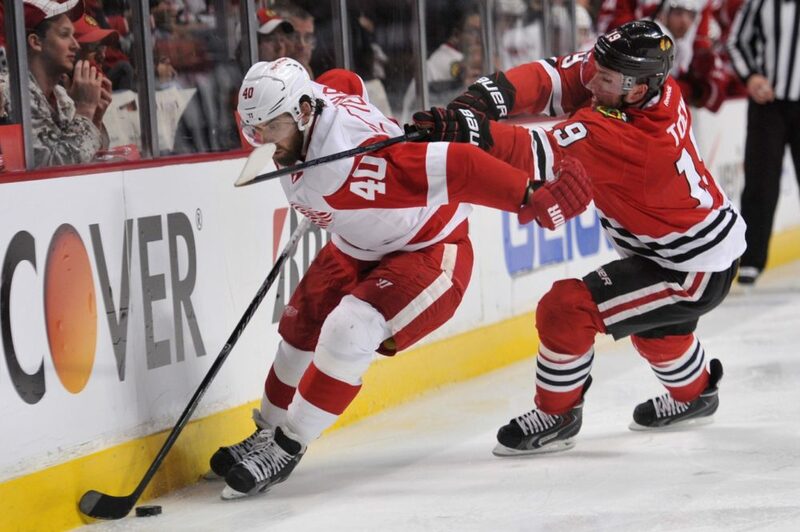 The Detroit Red Wings have come out hard and played a gritty game many have not seen from them for years. Gone is the puck moving finesse team that had so many great players wear its uniform and in its place is a gritty grind it out team that has frustrated the Chicago Blackhawks. The important thing for Blackhawks fans to remember is no one ever lost a series in 3 games, there is still plenty of hockey left. The Chicago Blackhawks need to get back to their game plan to be successful. In Game 3 the Blackhawks were clearly frustrated by the lack of success and lack of calls going their way, to be fair the officiating in Game 3 was horrible on both sides (Welcome to the NHL!). Jonathan Toews embodies his team’s attitude and the frustrated and angry captain has been distracted off of his game plan that has brought him so much success this season. After a lacklustre effort in Game 2, the Blackhawks have attempted to step up their physical play in Game 3, but it seemed as the game wore on they started to sacrifice their offensive game plan to get it done. There is no doubt the Blackhawks can be successful overloading the aging Red Wings with their speed and exposing a defense core that for the first time in 20 years does not include one of the best defenseman ever to play the game. You cannot fault Jonathan Toews for the predicament his team finds itself in, yes he is very uncharacteristically struggling to produce but his overall level of compete and effort remain at the maximum. Despite his faceoff struggles in Game 2 (41%) and Game 3 (47%), Toews led by example firing a team high 7 shots on goal, but continues to be snake bitten in this year’s playoffs. In Game 1 the Blackhawks were competitive in the faceoff dot, had their powerplay produce and got two even strength goals from unexpected sources (Oduya, Krueger). In Game 2 Detroit had started to calm the game down playing at their own pace. The Red Wings have iced the pairing of Ericsson and Kronwall which have been unexpectedly adept at shutting down the Saad-Toews-Hossa line in Game 2 and 3. Some positive notes coming out of Game 3 are that Patrick Kane has seemed to have shaken off his early slump, posting goals in two straight games as the Blackhawks only source of offense. Viktor Stalberg, despite almost breaking his neck in his first shift, had a really solid game and was the only third line player for the Blackhawks who did not take any stupid penalties. So far in the series, Detroit’s big guns of Zetterberg and Datsyuk have been outplaying, out-chancing and out-producing the best players of the Blackhawks, if this trend continues it could be an earlier than expected off season in Chicago. Jimmy Howard has rose to the challenge of stealing games, Game 3 was the perfect example as the Blackhawks came out firing but to no avail. The Blackhawks may have had one goal cheated away from them but Howard stood tall all game turning aside 39 of 40 shots. Chicago has too much talent and experience to be kept down for long, expect this series to go the distance and provide a fitting end to one of the best rivalries in the Western Conference.